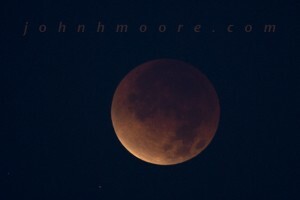 Early on the morning of December 10, 2011, I got to witness—and photograph—my first full lunar eclipse. Wow! If you ever get the chance to stay up and observe one, do it. For the most part, I like the photos that I got, but they are nothing compared to experiencing it firsthand. You can begin to understand why solar and lunar eclipses had such effects on earlier peoples. This photography adventure started with a lot of planning—looking at maps and angles and trying to find a good place to photograph the full arc of the eclipse (from beginning to end) with something interesting added to the frame. I hiked Torrey Pines State Reserve a couple days before the eclipse with a compass and camera, looking to see if I could find a great silhouette a Torrey Pine to place next to the moon. It had to be at the right angle for where the moon would be at full eclipse, had to be at some distance from my camera (so the long lens could capture both moon and silhouette), and I had to have a clear shot of it. No luck. I went down to Silver Strand State Beach to see if framing up either lighthouse on Point Loma would work, but they were too far away (even if the angles were right). The view from the Mount Soledad cross wouldn’t put anything interesting in the shot and the angles were marginal. Finally, I gave up and settled on just shooting the moon itself—with nothing else in the frame— from the cliffs near the Torrey Pines Gliderport. The day before the full lunar eclipse, I picked up a rental Nikkor 500mm lens and gigantic tripod with gimbal head. 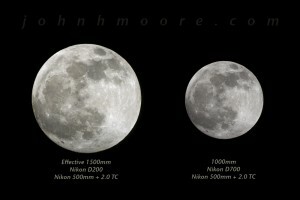 That night I played with shooting just the full moon, using my Nikkor 2.0 teleconverter and my two camera bodies. With my old Nikon D200 crop sensor, I had an effective 1,500mm lens… an with my newer Nikon D700m, I had a 1,000mm lens. The D200 doesn’t do low light very well, so I planned to shoot the time series from full moon to full eclipse with the D200 and then rapidly switch to the D700 to better capture the full eclipse. Because the full eclipse occurred too close both to sunrise and to the horizon (and we had pollution haze near the horizon… a gift from Los Angeles! ), we had literally a couple minutes to photograph the full eclipse before it disappeared into the haze and lightening sky. I never did manage to switch from the Nikon D200 to D700. It was a great experience and one which I hope to repeat someday. Though next time I want to find something interesting to frame the eclipse against, so it’s not just the moon by itself. Next time! Sadly, I missed the first shot of the series–the actual full moon. I thought I understood when I needed to get up and to my shooting site, but apparently I slightly misunderstood! The lower row is exposed for the portion of the moon that is still lit by the sun; the upper row is exposed for the portion of the moon that is eclipsed… when there are two shots above each other, they are at the same time point, but with different exposures. The interval between shots is 10 minutes. The last two shots (upper row) have a blue background because this full lunar eclipse occurred just before dawn and the sky turns a beautiful blue in pre-dawn long-exposure photos. This entry was posted on February 18, 2012. It was filed under Nature, Night.